Cartoonist Tad Dorgan, local San Francisco boy, seems to have been about as well known as anyone could be in the days before radio kicked in in 1925, decades before TV became standard in the American home. 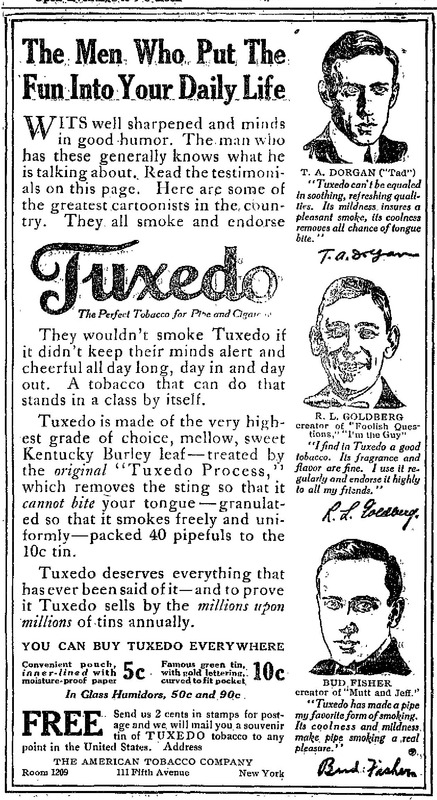 Check out this ad from 1914, which puts Tad at the top of the heap. Yeah, the odds that Hammett’s “Tad’s blind man” comes from this Tad are looking better and better. This entry was posted in Dash, Frisco and tagged Tad Dorgan, Tad's blind man, Tuxedo tobacco. Bookmark the permalink.